September 2nd - RIP Adrenal Glands! My BLA is scheduled for September 2nd. It's real now! I will finally be trading up - getting rid of Cushing's Disease in exchange for Addison's Disease. Nothing else too exciting to say about that. It seems so far away but too soon all at the same time. This article made me really sad - the emotional and cognitive symptoms of Cushing's have definitely been some of the hardest for me to deal with. Academics came easily to me throughout middle and high school, but once I got to college I started having trouble focusing and couldn't seem to wrap my head around complex concepts. I couldn't study for tests, I felt like I had no memory. It didn't help that my messed up sleeping pattern made me too tired to go to class some days. Everyone (myself included) assumed that the freedom of college and lack of structure was to blame for my horrendous grades. I seemed to fall behind at the beginning of every semester with some sort of disaster, then never caught up. After being diagnosed, it was so validating to hear that I wasn't just lazy and stupid - something I thought I had known all along but definitely doubted sometimes. 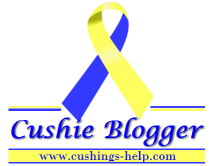 This article describes the effect Cushing's Disease has on the brain. It's scary, and I hope after my surgery in September I will start getting some of my brain power back!